ProDen PlaqueOff Dental Bites are an innovation, essential to your dog’s oral health. Part of the popular PlaqueOff Animal Powder range, the Dental Bites are handy bite sized treats that your cat or dog will love. No spoons, no mess! Unlike other methods for controlling dental plaque, PlaqueOff Dental Bites are unique, working systematically, preventing dental plaque from sticking to the teeth and softening the tartar deposits. An improvement can usually be seen by the third week of treatment. 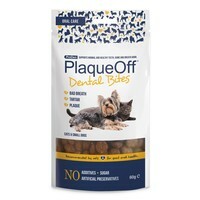 PlaqueOff Bites have the same effect as PlaqueOff Animal powder but have been developed as an alternative method of delivery. Algua AN D1070, Wheat, Maize, Barley, Wheat Bran, Poultry Fat, Flavouring Innard. Contains No Preservatives, Additives or Colourants. Tried these as my dog has quite a build up of plaque despite regular cleaning. Could see a difference very quickly and his teeth are a lot cleaner before and after cleaning. Bonus is both of my dogs love these biscuits and so no problem getting them to eat them. This small and tasty treat is a simple way of keeping my cats' teeth clean. They love the crunchy texture.